Today has been quite the random nonsensical day! The odd quirky things that happen to me as odd thoughts run through my head are to obscure to keep to myself. Therefore I must share. 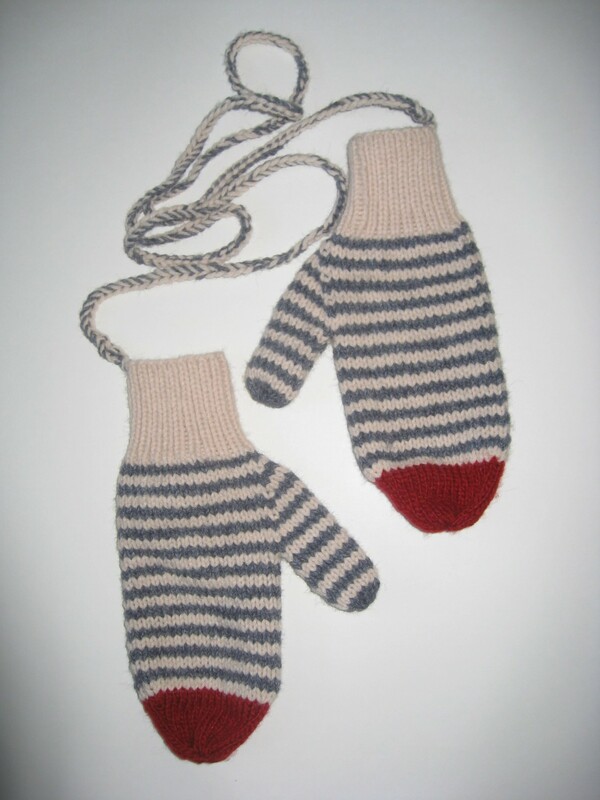 String Mittens! How random is that? I grew up with mitts hanging from my sleeves because I was notorious for loosing them. I often had a single mitt or two right mitts. In fact, I currently have 2 left red Canada Olympic mitts in my cubby at the back door. I work with preschoolers – 32 of them actually. Only 2 use string mitts. One child wears them because I am sure her mom grew up with them here in Edmonton. They just make good sense for young ones. They ALWAYS know the mitts are hanging from the sleeve for the moment of need. The other child, is what I lovingly refer to as “an out of towner”. That means they are born some place hot – that means anywhere that isn’t spelled C A N A D A. Only this child wears the string on the OUTSIDE of her jacket. Odd… but common. I attempted to sho the child how to wear the mitts. I was told in no uncertain terms I was WRONG. Fine… But tell me, what is the purpose of the string then? For that random moment when you need a skipping rope? Strangling your brother? Tripping up your feet so when you fall your hands are strapped to your sides and can’t save you? Please tell me! I am now curious. For all you Out of Towners and Locals If you are looking for gorgeous mitts and sweaters and things, check out my favorite knitter Margaret at Knit Pickers. I love her Barn Sweater Touque and Scarf – I have been meaning to order a pair and will get on that soon. I’m sure she will add an idiot string if I ask her too!! I mother everyone. Random…but true. I have a student who accidentally calls me “Mum” hmmmm maybe I need to look at how I am treating him a little more closely. Sure I have favorites, but not all my favorites call me mum. THEN, after my son’s curling match today, I gave his teammate a lift. The manboy who is over 6 feet but has the face of a 12 year old was going to take the bus home. Yikes. It was dark, it is not the nicest of neighbourhoods, I would be up worrying about him all night, so I gave him a ride. He was very gracious and appreciative, his mom taught him excellent manners! (there is nothing I despise more, than giving some kid a lift and they never even say thank you! TEACH YOUR CHILDREN MANNERS PLEASE). Then there is another manboy friend of my son. He posted on facebook that he finally understood his math after hours of study. I wanted to post a long and encouraging comment…but high school guys don’t want a dodgy old mom commenting, so I liked…I probably shouldn’t have even liked – but I LOVE this manboy! I would adopt him if he needed me too. Speaking adopting…never leave your neglected child within arms reach of me. I will mom them and them try to keep them. Some people love cats, I like to mom kids. I am an awesome mom to strangers but a sucky mom to my own… I went to the curling rink to watch my son’s first match of the season. I sat for 5 minutes then fell asleep for 30. Random… Clearly I am tired. Well why not? I have been dreaming of beetles crawling in my hair and on the back of my neck so I wake up scratching my head. Not enough sleep… RAID! I have been doing a bit of Character Development for a pal of mine over at Back of the Packer It has been DECADES since I have developed original cartoon characters. I must say, it has been so fun! I have been doing this in support of his drive for 12 marathons in a year. Yes that is a random goal, yes my support of him is odd and random – but that is the type of friend I am – unexpectedly random. He is raising money for Make-A-Wish foundation. Since I love to mom kids, I love this charity too. I know children who have been on the receiving end of wishes and I cannot tell you how wonderful it was to see their joy! It does a mom’s heart good. Support kids charities!!! I read ABC Head Start’s Blog today entitled ‘Do you speak Head Start?” Why yes I do! I know…that is random. It is like knowing a second language filled with hidden meaning. Don’t know what I am talking about? Head over to her blog, its great…and a bit random. The was an ocean and a forest and a knight and a princess and a boy who was a big boy and a boat and it roweded it. The Forrest and the Ocean and the Knight and the Princess and the big boy and a boat and the moon and the knight…. I lost interest at that point… It takes a lot to keep my mind in random mode. < Running Swag is Where it’s At! That “yee-hah” sound you heard last night took a while to get to you. After all, the speed of sound isn’t that fast. FYI – NO one likes mayonnaise in their burgers – so for the love of all things delicious STOP IT RIGHT NOW! Teach them about Saskatoon Pie, Poutine and maple salmon. Cold is a problem. I will pick them up in the warm airport, walk them through the warm car park and into my heated garage. Wait a minute…what problem? Random is good, it helps work out the bugs in your brain. Your mitts aren’t 2 right mitts are they? Want to trade? ha 😉 Congratulations on the Canuck Chocolate!!!! Mmmmm Kit Kat Chunk is THE best 😀 it has been a good year since I have had one! Curling match? Curling rink? You guys fix hair for sport up there?